What a wonderful June! We've had perfect working weather, fun projects and a terrific garden tour. Thanks again to everyone who came out to support the Symphony Guild at the Music in the Garden event. We hope you had as much fun as we did! In this newsletter, we'll share the transformation of one of the trickiest spaces we've ever seen, offer a few ideas from the resulting garden, and give a summer reading list of five of our favorite garden books. Be sure to scroll through the main journal when you're done. In the last month, we've posted some great pictures, a guide to building simple and great looking tomato cages, a little about how we use metal in our designs and more. 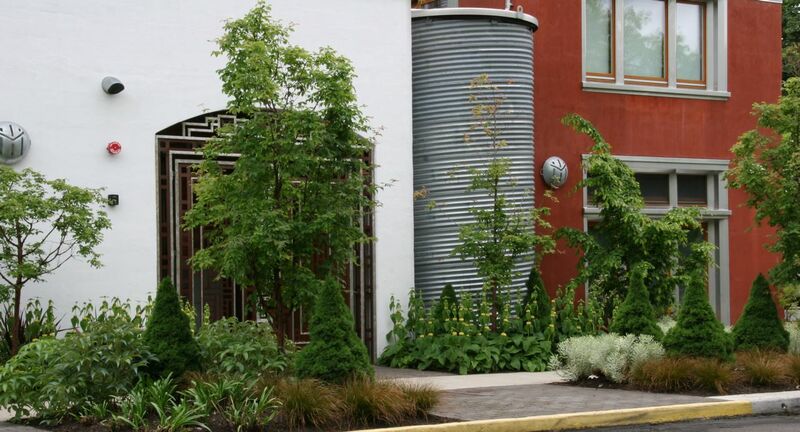 In our initial consultation, Ted and Nancy requested an irrigated container garden in their small back yard. The problem was hiding the irrigation. Previous owners had finished the basement of the house and poured concrete over the entire flat space behind the house. A steep hillside required a tall, cinder block retaining wall. Add in narrow dimensions and a stellar view of the heat pump, and, as you can see below, the space was irrigation-proof and less than attractive. We used four main hardscape elements to create the Dobsons' garden: gravel, ipe (a sustainably forested hardwood) decking, stepping stones and bamboo screens. In a tiny space, everything needs a purpose, and each of these elements blends form and function. A large, local river gravel covers the concrete and irrigation while still allowing water to freely enter the drain system, but visitors only notice its cohesive, subtle texture. The ipe decks give the Dobsons a place to enjoy their garden, and its rich color and strong lines contrast with the lighter, more natural feeling of the stone elements. We borrowed the excellent Japanese concept of using large stepping stones as both a stable walking surface and a way of focusing attention on the journey, rather than the destination, thus keeping energy in the tiny garden. Finally, simple bamboo screens frame an enticing view between separate two garden rooms - the seating area and the pathway or journey garden - and, oh yeah, hide the heat pump from the seating area. Our design surprised the Dobsons, who had expected a quick meeting about irrigation, but it captured their imaginations. 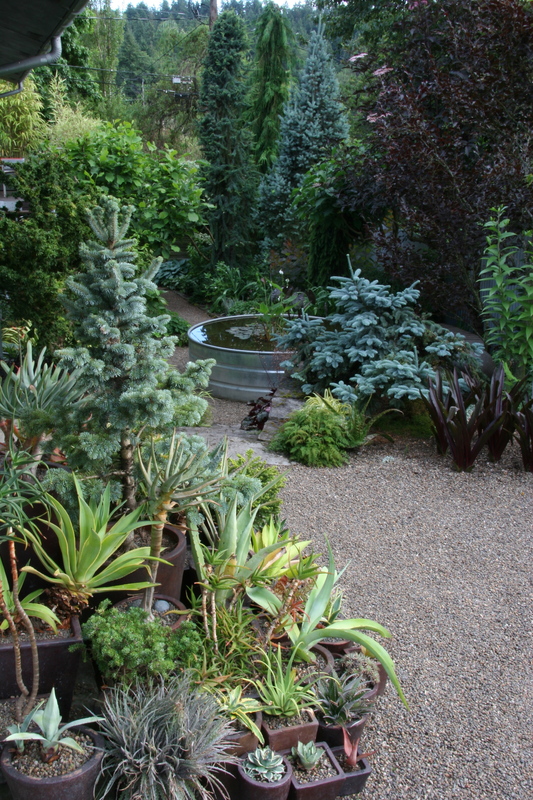 We installed the hardscape of their garden in spring of 2006. At the time, they were casual gardeners, planting a few annuals here and there and keeping a very tidy lawn. However, something in their new space set their prodigious energies and curious minds to work, and they elected to plant the new garden themselves. In the intervening years, Ted and Nancy have created a thoughtful, Japanese-inspired planting, which meshes perfectly with their cool, quiet space. The gardening didn't stop there, however. 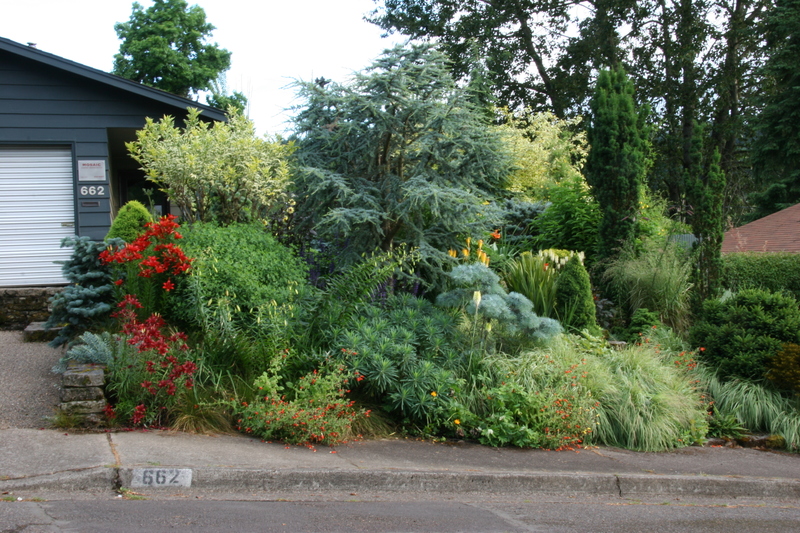 The front garden, which expands by the season, is a colorful contrast to the understated space in the back. Today, the Dobsons are regulars on garden tours and make long day trips to check out new nurseries. Every season finds them mulling over a new project and perfecting the existing plantings. The Dobsons' tricky space is a terrific illustration of some of our core design concepts. Below are three ideas that can help turn a difficult space into an inviting garden. Think big, even in a small space. Ample hardscape makes a tiny garden more welcoming. Approximately 2' wide stepping stones are an eye-catching invitation to stroll and the 8' x 14' ipe deck is a perfect spot for a glass of wine with friends. Multitasking hardscape. 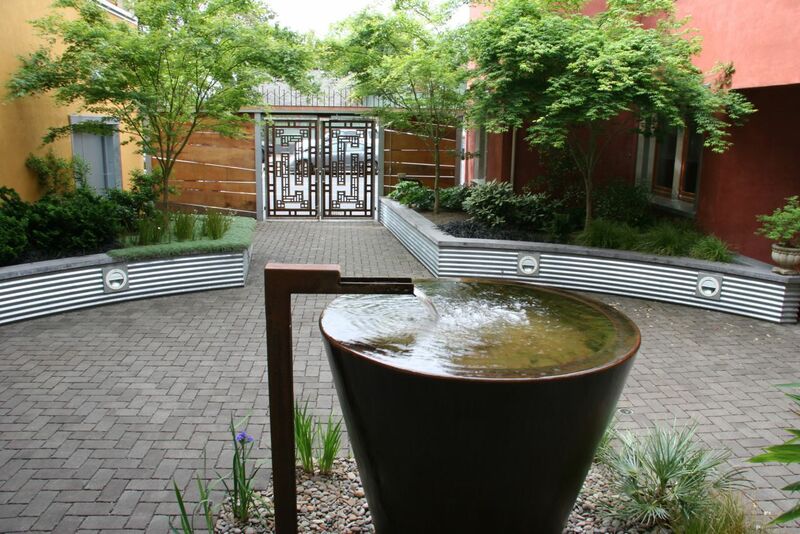 Combining simple form with multiple functions keeps the garden cohesive and uncluttered. The Dobsons' bamboo screens frame the view of their path, separate the garden rooms, provide a striking backdrop for planted arrangements, and screen the heat pump. Limitations as framework. More often than not, careful and creative thought can turn an apparent disadvantage into a guideline for great design. The concrete floor of the Dobsons' original "yard" is still under the layers of rich materials. What seemed at first like an unsightly, insurmountable obstacle became the inspiration for a terrific garden. Here are five of our favorite garden design books for some summer inspiration. If you can't find them locally (I've seen several of these available used), we've linked to online sources. The Modern Japanese Garden - This book by Michiko Rico Nose is as much a study in simplicity, honesty of materials and effective use of space as it is a review of contemporary Japanese gardens. Breaking Ground - The first garden book we loved, and one to which we regularly return for inspiration. A thoughtful introduction to ten contemporary garden designers by Page Dickey. Gardens in the Spirit of Place - Page Dickey explores gardens that look to the surrounding landscape and culture for their inspiration. The Essential Garden Book - As close to a "how to" as you can get in garden design, by Terrance Conran. In the Company of Stone - Daniel Stone is a master in the art and craft of stonework, and this beautiful book by Dan Snow should be on every rock geek's shelves. We're already brainstorming for the next newsletter. In the meantime, bookmark the journal and check back every few days. In the next month we'll share some process photos of the gorgeous, dry stack stone wall we're building, and, hopefully, some new portfolio shots. If you want to be the first to know about the newsletters and Mosaic news, join our mailing list! We write once or twice a month at most, and we'll never share your contact information. We are rarely visited by deer in our part of Eugene. In fact, the hungry boogers haven't browsed in our garden for a few years now... until today. Fortunately, the damage wasn't bad - just the tips of a rose and some raspberries - but it was enough to remind us of how much damage some uninvited guests can do. Many of our clients' gardens can seem like deer superhighways, however. With a lot of experimentation and a little help from our friends, we've developed a broad deer-resistant palette. Of course, there's no such thing as a "deer proof" plant, and every garden is different, but these photos of frequently visited gardens might surprise anyone who thinks they can't share a great garden with deer. The below page from the April '08 Sunset fails to mention that the garden in the photograph is one of our best testing grounds for deer. The photo features two of our favorite types of deer-resistant plants: dwarf conifers (in the photo - Picea sitchensis 'Papoose') and hellebores (Helleborus x Sternii). Do you have deer? Have you discovered any plants that aren't on the conventional lists? We're always searching for new ideas, and we hope you'll leave a comment with your "finds" below. Every day brings new leaves, blooms and ideas at this time of year. While starting new designs and watching previous years' installations grow up and out, we thought it would be fun to share some more of our work online. We updated the portfolio and press pages of our website, and we're starting this journal to share photos, upcoming events, and newsletters, like this one. In our first newsletter, we are proud to introduce one of our favorite small spaces. Of course, you may have already met in Sunset, Fine Gardening, the Register-Guard or Pacific Horticulture! Joy Gregory's garden is a perfect example of how a challenging space can become a terrific garden. Whether you're ready to give us a call or you're a do-it-yourselfer, we hope to offer inspiration for your spring garden plans. Joy Gregory chose her North Eugene home with her son in mind. The house was a great fit, and the neighborhood was full of other young families. There was even a big meadow across the street that served as a natural neighborhood playground. The only problem was that Joy missed having a garden. The backyard was big enough for her son and the dogs to play, but did not leave room for much else. It would have to be the front yard, but where to start? As you can see in the photo below, the existing landscape was little more than a bland 900 square foot postage stamp of scrappy lawn with a handful of boring shrubs. With low expectations, Joy called for help. Joy was well aware of the limitations of her property, but she hoped we could create a garden that was welcoming to visitors while providing a quiet space for her to relax with her son or a friend. By using ample hardscape, focal points and some creative screening we were able to design the framework for accomplishing her goals. 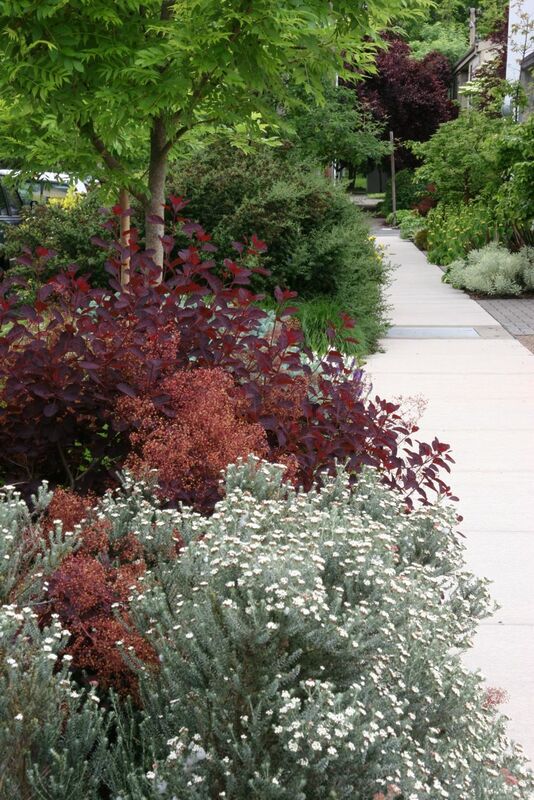 The secrets to enticing people into a garden are wide, welcoming pathways and large focal points. 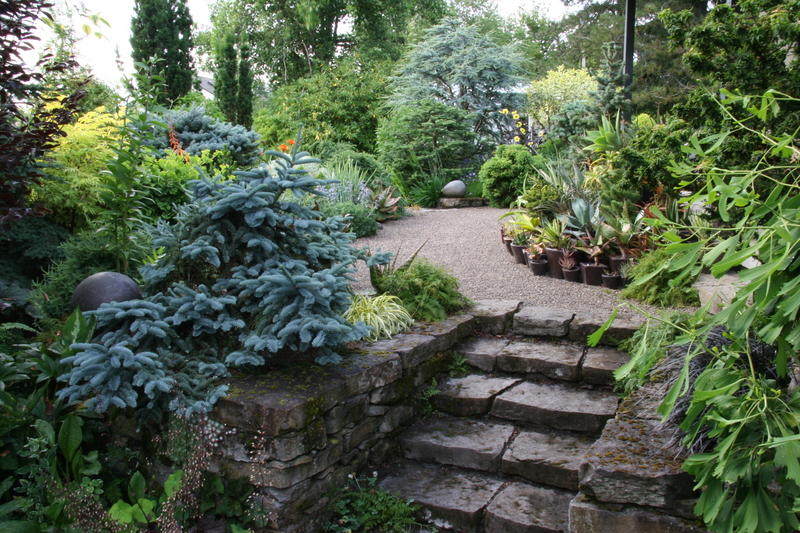 In Joy's garden, a planted Vietnamese urn and six-foot wide sandstone path invite visitors into the space. Creating a private space in such a small, open yard was a challenge. The only spot that was far enough from the sidewalk and main pathways was right at the property line, just beyond the neighbor's front porch. 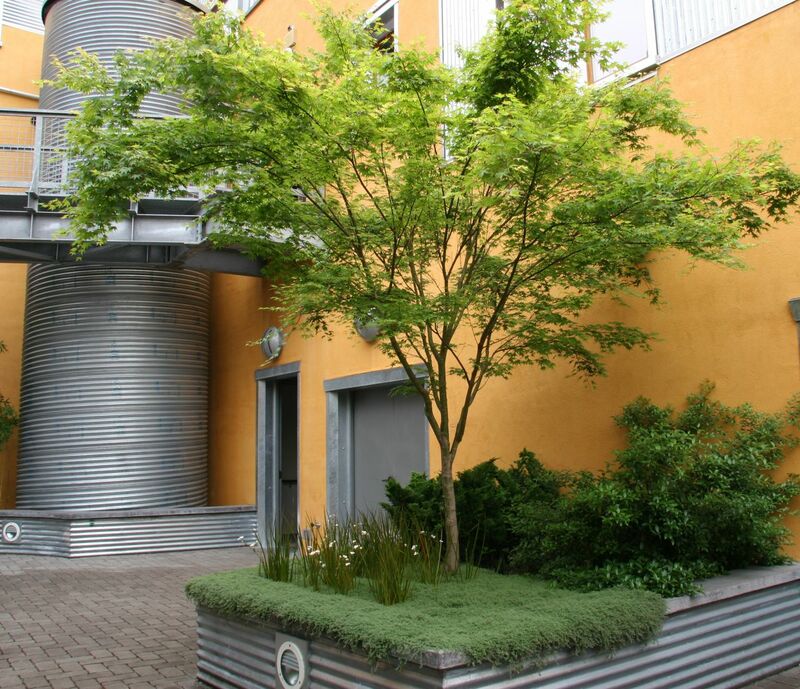 We installed a 6'x9' rusting metal wall to provide screening without enclosing the garden and let plants to the rest. A sandstone bench is a striking final note to the garden, as well as a quiet place for Joy and her son to enjoy the garden. love of color and form. Of course, as a busy young mother, she needed a garden that was low maintenance. She seemed a bit surprised when we said, "no problem." 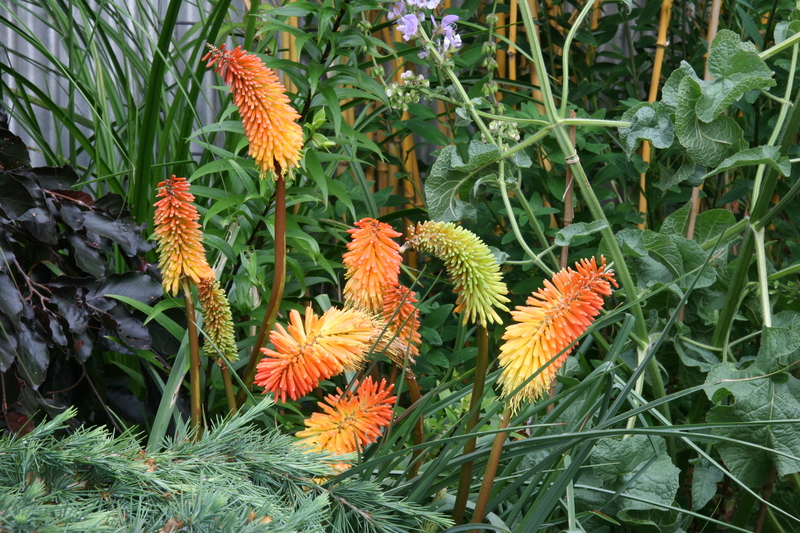 The key to a colorful and low maintenance space is to focus on foliage texture and color rather than flowers. Of course, some flowers happen along the way, but in the photo and list below are six terrific, easy plants that will catch your eye for all or most of the year! Foliage is fun, but in our minds, it's the structural and sculptural plants that complete Joy's garden. Big grasses screen the seating area, while round, spiky and Dr. Seussian evergreen plants give the garden form and a little whimsy. Below is a list of five plants that "make" this little garden. We hope you enjoyed our first newsletter! We'll use this space to share news, photos and upcoming events as well as longer newsletter articles like this one, so please check in again. If you have questions about the Gregory garden or there's anything you would like for us to discuss in the future (the design of our garden? deer plantings? small space design? ), please leave a comment below. Until then, we hope you'll visit the website for inspiration and magazine articles, including two about the Gregory garden. If you would like to schedule your garden project for this summer or fall, please call (541) 434-6467 to schedule a consultation. We look forward to hearing from you!